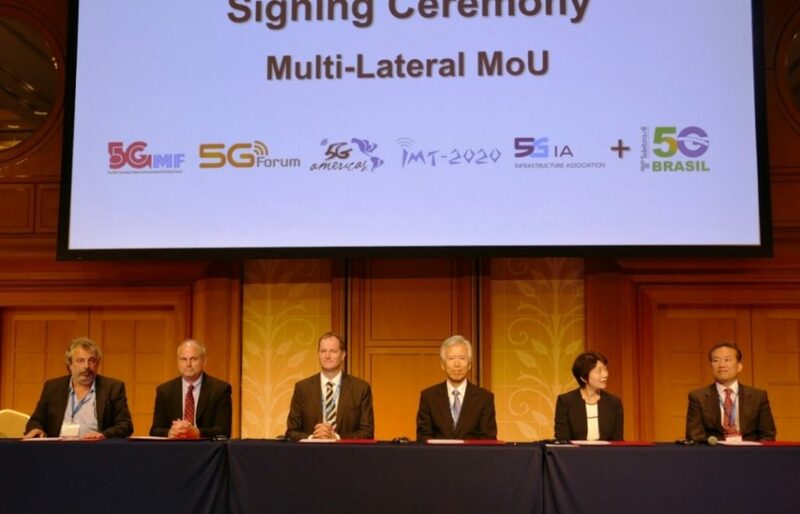 The 5GMF (The Fifth Generation Mobile Communications Promotion Forum), the leading 5G visionary organization in Japan, organized the third Global 5G Event with world’s 5G promotion organizations : 5G Forum, 5G Americas, IMT-2020 (5G) PG, 5G-IA. The 3rd Global 5G Event was held at the Hilton Tokyo Odaiba on 24-25 May 2017, with the theme of ‘Creating the Crossover Collaboration for 5G Eco-Society’. About 700 attendees, from both Japan and abroad, participated in fruitful and meaningful discussions at the Event. Prof. Giovanni Emanuele Corazza stated that the 3rd Global 5G Event has clearly shown the worldwide momentum in the development of the future 5G eco-system, with current emphasis placed on four areas: standardisation actions in 3GPP, spectrum harmonisation at regional and global level, trials with international cooperation, and integration with vertical industries. Europe has confirmed its positive ability for coordinated action and is going to display a wide set of 5G technology demonstrations in a large number of cities, although other regions might achieve slightly faster roll-out for specific features. Notwithstanding this race for early demonstrations, 5G research shall continue for several years, as these systems require continuous evolution to reach full maturity. Finally, it must be noted that operators are in general favourable to a gradual approach leading to the full exploitation of both 4G and 5G opportunities. In addition, the 5GMF, 5G Forum, IMT-2020 (5G) Promotion Group and 5G-IA welcomed Telebrasil – Projeto “5G Brasil” as a party to the Multilateral Memorandum of Understanding (MoU) for the “Global 5G Event” with 5G Forum (Korea), 5G Americas (Americas), IMT-2020 (5G) Promotion Group (China), the 5G Infrastructure Association (5G-IA, Europe) and the Fifth-Generation Mobile Communications Promotion Forum (5GMF, Japan). Prof. Jose Marcos C. Brito, Secretary General of Telebrasil – Projeto “5G Brasil” signed an accession agreement for the MoU on 24 May 2017 during the 3rd Global 5G Event in Tokyo, Japan hosted by 5GMF. The event is held twice a year in rotation. 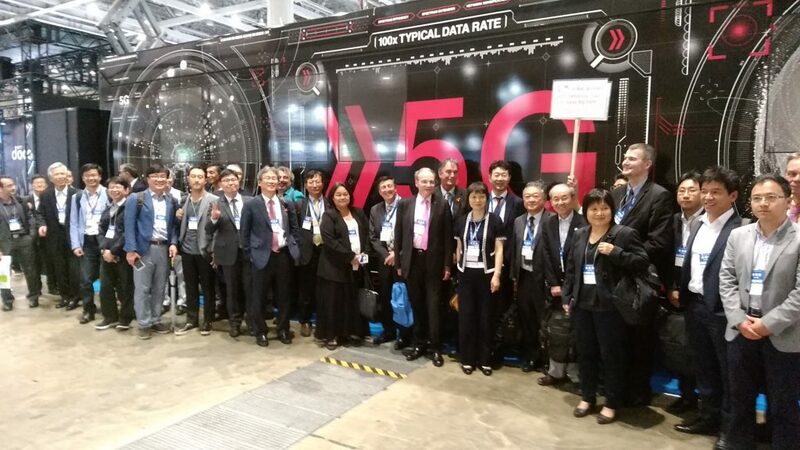 Last year, the 1st Global 5G Event was held in Beijing, China by IMT-2020 (5G) Promotion Group and the 2nd event was held in Rome, Italy by 5G-IA. The next 4th Global 5G Event organized by 5G Forum will take place in Seoul Korea on 22-24 November 2017. It will focus on “Building a Bridge to 5G Reality”. Hot news on “5G Field Trial Project in Japan” that will be started in 2017 were shared. Latest global topics on the 5G spectrum harmonization, collaboration with verticals were also discussed. 5G field trials were one of the hottest topic discussed. 5G field trials were highlighted by 5G organisations, by MNOs and leading equipment vendors. 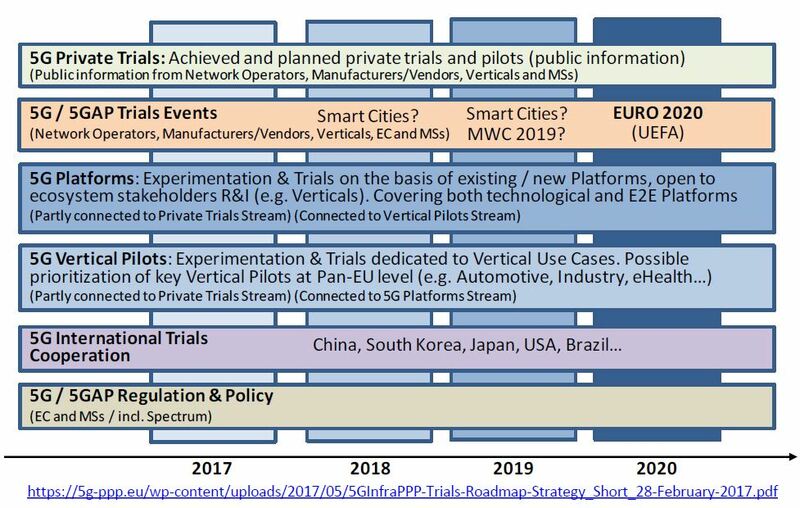 In Europe, the 5G Pan-EU Trials Roadmap was shown by Didier Bourse, Chair of 5G-IA Trials Working Group. ➧ Click here to enlarge or see there. Wan Lei, Director of Huawei Wireless Standard showed hisviews on a global worldwide 5G trial plan. ➧ Click here to enlarge. National work plans were in-depth presented. Spectrum harmonisation was another key item. The 11 candidate bands of WRC-19 AI 1.13 and 27.5-29.5 GHz (24.25-27.5 GHz, 37-40.5 GHz, 42.5-43.5 GHz, 45.5-47 GHz, 47.2-50.2 GHz, 50.4-52.6 GHz, 66-76 GHz and 81-86 GHz, 31.8-33.4 GHz, 40.5-42.5 GHz and 47-47.2 GHz) are evaluated at country levels considering the harmonisation with the other countries. The 5GMF indicated its preference for partial of whole of the following bands for initial use: 24.25-27.5 GHz, 27.5-29.5 GHZ, 31.8-33.4 GHz, 37.0-40.5 GHz, 40.5-42.5 GHz. In Europe, three pioneer bands have been identified. The region expects to be deploying trials in each of these bands in the 2018-2020 time frame: 700 MHz, 3.4-3.8 GHz, 24.25-27.5 GHz. 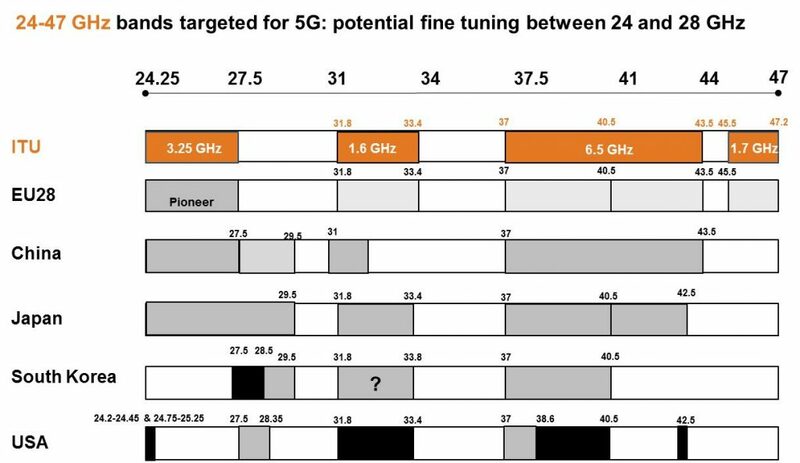 Consensus is growing around a number of bands, including the 24.25-27.5 GHz, 31-34 GHz and 37-40.5 GHz. The 2017 IEEE Conference on Standards for Communications & Networking (CSCN’17), going to be held in Helsinki. The dates of CSCN’17 were deliberately chosen to have the conference right after the Q3 Broadband Forum meeting that will take place in Helsinki, Finland (11– 14 Sep. 2017). IEEE CSCN 2017 will be collocated with the IEEE 5G-IoT Summit Helsinki, together forming the Helsinki5GWeek. CSCN’17 will deliver a rich technical program discussing the future of mobile communications systems, offering distinguished keynotes, panels and technical sessions. The technical sessions will consist of technical papers reviewed and selected by an international technical program committee representing both academia and industry, with a strong standardization background. -Programmable Architecture for 5G services and verticals. -Central Cloud Computing vs Edge-Fog Computing. -5G Functional Decomposition and Deployment. -Secure Operations in Future Virtualized Networks. -Resource Management for Network Slicing. -Dedicated core network functions and shared network slices. -Network slicing issues with multi-RATs devices. -Cross-slice management for End-to- end QoS. -Elastic Resource sharing in Virtualized Networks. -Joint storage, computational, and communication resource optimization. -Fundamental trade-offs in Network Softwarization. -Experimentation experience in Softwarization and Network Slicing. -SDN northbound, southbound and east-west interfaces. -SDN programming languages and data models. -Progress and future challenges in ETSI NFV. -Progress and future challenges in IETF/IRTF related WGs/RGs. -SDN and NFV in wireless and mobile networks. -Orchestration and Management in SDN and NFV. -Multi-domain considerations in SDN and NFV. -SDN and NFV in multi-tenancy environment. -Open Source efforts (e.g., ETSI NFV, OPNFV, OpenStack, OpenMANO). -QoS/QoE aspects related to SDN and NFV based network services. -Inter/Intra Data Center considerations for hosting SDN and NFV based network services. -Performance, Fault and Lifecycle management of virtualized network functions and network services. -Carrier-grade performance considerations in SDN and NFV based infrastructures. The Berlin 5G Week’17 (6-10 November 2017) will deal with 5G hot topics, such as software-defined networks, network virtualization, network slicing for 5G verticals, Industrial Internet/IoT, 5G multi-access network support, and 5G testbeds and most recent technology PoCs. Three of the most solid events related to software-based networks and 5G technologies are scheduled during the week 3rd IEEE NFV-SDN Conference (6-8 November 2017), Industrial IoT Forum (8 November 2017) and the 8th FOKUS FUSECO FORUM (9-10 November 2017). Workshop Chairs: Ioannis Giannoulakis, NCSRD Greece – Evangelos Markakis, TEIC Greece – Josep Martrat, ATOS Spain – George Xilouris, NCSR Demokritos Greece – Anastasios Zafeiropoulos, UBITECH Greece – Carlos Jesus Bernardos Cano, Universidad Carlos III de Madrid Spain. The 4th Workshop on NFVPN takes place at Fraunhofer-Forum, Anna-Louisa Karsch Strasse 2, 10178 Berlin, Germany. Workshop chairs: Stuart Clayman, University College London, UK -Walter Cerroni, University of Bologna, Italy – Barbara Martini, CNIT, Pisa, Italy – Federica Paganelli, CNIT, Firenze, Italy. The 3rd IEEE Workshop in O4SDI takes place at Fraunhofer-Forum, Anna-Louisa Karsch Strasse 2, 10178 Berlin, Germany. In addition, 5G-IA was asked to give a talk on 5G testbeds.